Unfortunately, it seems the time has come. Rust spots are starting to form underneath the previous owners “wonderful” krylon paint job. So I guess I better take care of the rust before it gets worse. Since my frame isn’t doing much better, I will be painting the frame along with the tub. 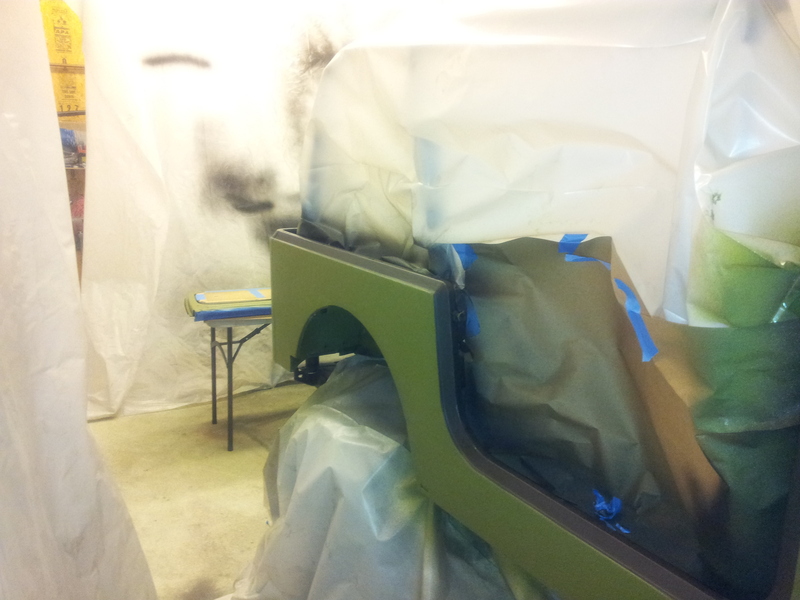 The only thing that I won’t be painting is the engine, my bumpers, and the interior of the tub. I am going to be doing more work inside and I don’t want to ruin a new paint job by scratching it. Obviously, the first step is to remove everything. 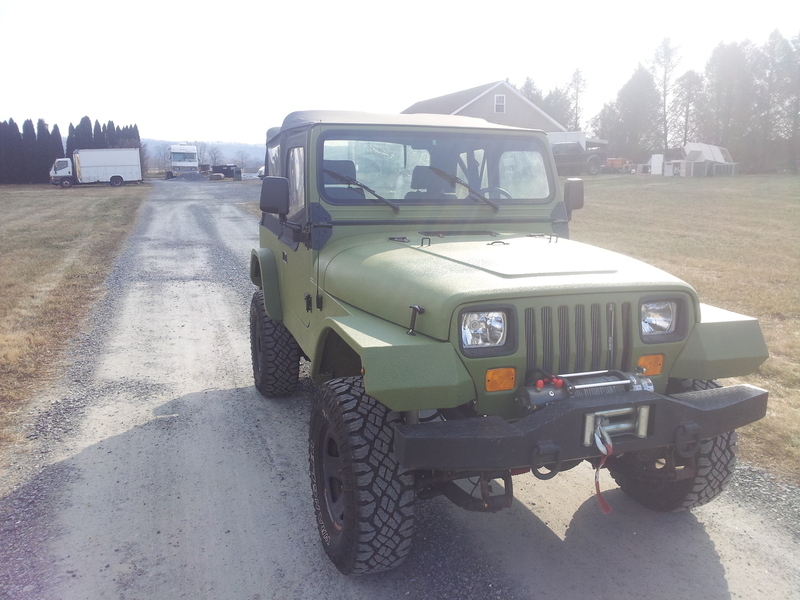 Remove doors, windshield, seats, engine and axles. Fortunately, my frame is not too bad. Most of the rust is in the back. 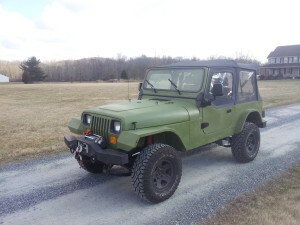 I used Auto Rust’s Rear Shackle Mount Section and Auto Rust Center Crossmember Gas Tank Support. 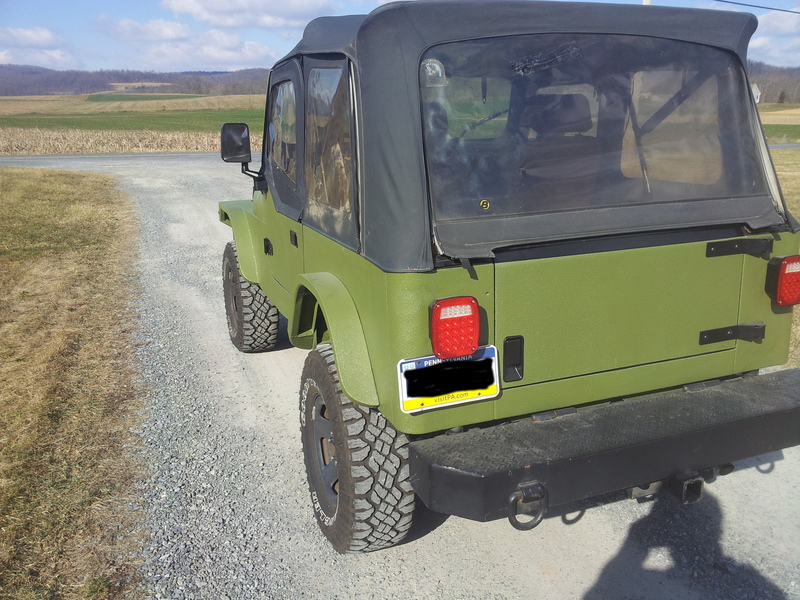 The rear shackle mount fit perfectly. 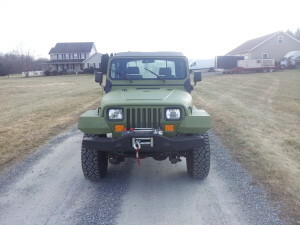 The only problem I had was with my custom bumper. 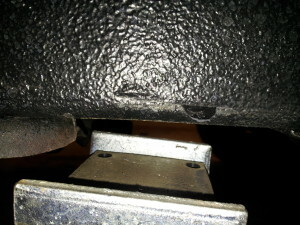 The bumper could not accept the slightly larger frame. This was easily fixed. The other problem I had is with the gas tank support. This support was much too high and wouldn’t allow my tub to rest on the body mounts. Since I didn’t discover this until my frame and tub was painted, the only recourse I had was to install a one inch body lift kit. The frame has a lot of surface rust. To help prevent the rust from spreading, I used Por-15 as a primer. I did the same thing underneath the tub, however, the technique I used was different. With both the tub and frame, I used Metal ready to prep any non rusted metal. Then I painted the Por-15 with a paint brush. On the frame I allowed the Por-15 to fully cure. 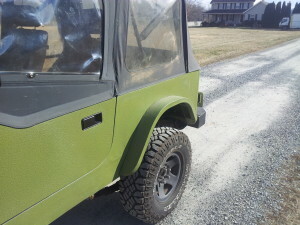 On the tub; however; I painted the Por-15, allowed it to get tacky, then painted on the Raptor Liner. This seems to be the best way. If the Por-15 is allowed to cure, the Raptor Liner won’t have as strong of a bond and can chip of revealing the Por-15 underneath. As you can see in the picture above, my car lift has rubbed on my frame. This caused the liner to chip off, revealing the Por-15 underneath. When I started to sand the tub, I found out why the previous owner painted it. There were four patches on the tub. There was one at the front lower corner and one at the back; after the door but before the fender. Both sides were like this. There was only one problem. The previous owner was an idiot. The patches were not level with the rest of the body. GGRRRRR. They were probably pushed inn about a quarter of an inch. 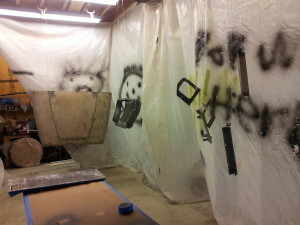 This was then filled in with body filler. If your Jeep is like this, or has bad rust spots, all I can say is good luck. J Ok, I can tell you a little more than that. The best way to remove the bad spots is with a grinder and a cutting wheel. When cutting out the bad steel, make the cut as square as possible. This will make the fitting of the patch steel much easier. 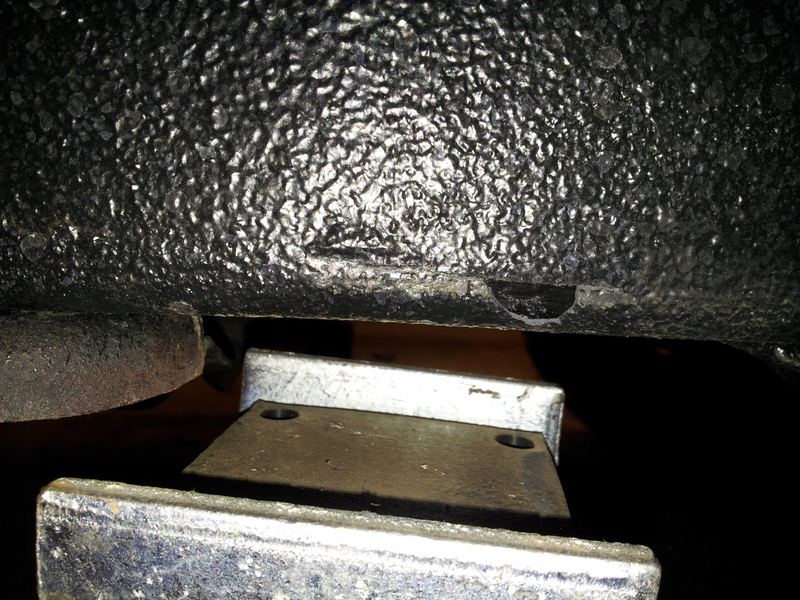 Now when you weld in the patch, you have to clamp the patch so that it is level with the original material. This is probably what the previous owner failed to do. Get some But welding Clamps . These stupid little clamps are vital to get the patch level with the rest of the body. When you weld, do very short weld beads, and move the welding around. So, weld the top corner with a bead that is about a quarter inch long, move a couple of inches, weld, and continue this process all the way around the patch until you are done. This will prevent the metal from overheating and warping; WHICH HAPPENS VERY EASILY! The only other tool that you should get is a decent body hammer and Dolly set . This will be very useful when you need to shape or straighten steel. 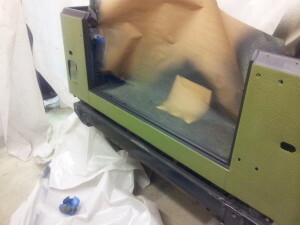 I am painting the tub and; as I eluded to before; the frame with U-POL’s Raptor Liner. It is a diy, spray on bedliner. For the frame, I used straight black. With the tub, I used the tintable liner. The only caveat with the tintable version is that it is hard to get certain colors. To tint the liner, you must put in urethane paint (up to %10). The problem is that you are adding the paint to an off white bead liner. This does funny things to colors. At first I wanted a deep reddish orange. But all I got was pink. 🙁 So I went with the darkest olive green my paint supplier had. When adding the tint to each bottle, a huge syringe is vital if you want to get a consistent color. once you mix in the tint and hardener, you just shake the bottle, attach the bottle to the gun, and spray it. I found out that if you bring the gun in close, the texture will be smooth. But if you move the gun further away, the texture will be sharper.The Raptor liner can be bought in kits, or each bottle can be purchased individually. A kit contains four bottles, hardener, and a gun. I bought my kits at TPTools.com. The frame only took one kit to completely cover. The tub, however, took about 4 kits. This covered everything but the inside of the tub. There is one important step that you must do before applying the Raptor Liner. YOU MUST APPLY A PRIMER! If there is just a little bit of steel showing through whatever your base coat is, the liner won’t stick. 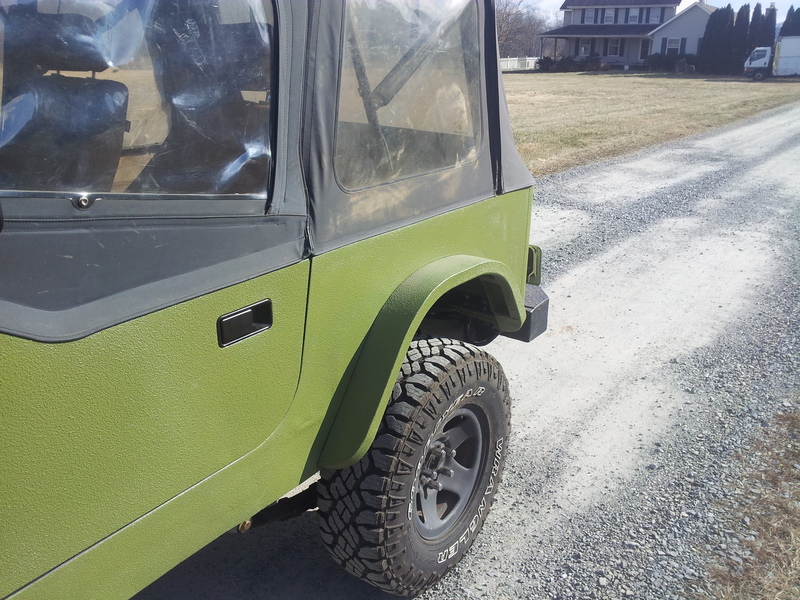 Besides the Por-15, I used U-Pol Acid Etch primer on the fenders. When I ran out of this, I picked up some epoxy primer and etchant made by PPG. While it is not absolutely necessary to use PPG etchant, it is a good idea to use it; it creates a better surface for the epoxy primer to bite into. Between the two primers; U-Pol’s Acid Etch and PPG’s system; I would say that PPG’s system is best. It seems to be a more durable surface then U-Pol’s Acid Etch primer. I did not use body filler. I had two reasons for this. I was unsure how tough body filler would be. Body filler is basically a plastic, which is much softer than steel. If a stone hit the body filler; it may give more than the steel. This could either cause the paint to separate from the filler, cause the filler to separate from the steel, or both. However; I could be paranoid. Also, it is an off-road vehicle. Why would I spend hours in painstaking sanding to get a smooth body only to have a rock smack into the body causing another dent? One thing that I was worried about with the bedliner was the texture. I wasn’t sure if the texture would mess up the door seal or not. I was also worried that the texture would interior with the soft top. To fix both of the possible headaches, I painted a black strip all the way around the tub. To help seal the hinges, and make sure they sit level, I put a Viton sheet under each hing. This was probably unnecessary tho. I removed a hinge and found that the liner leveled off anyway. The Raptor liner came out quite well. It seems fairly tough. When I was working on my Jeep, I laid many tools, like hammers, screwdrivers. Pliers, ect) directly and ungingerly (yes, I know it isn’t a word) onto the fenders and winch plate. These areas don’t show any scratches or chips. Another plus is the ease of touch up. There isn’t a clear coat to remove, so, all that is necessary is to degrees and spray. Heres a video after about 3 years showing how the raptor liner held up.